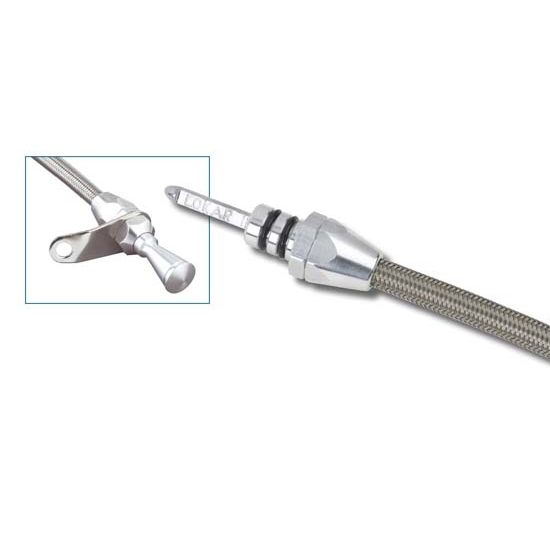 You have flexibility with our Teflon-lined Flexible Braided Stainless Transmission Dipstick. Kit comes complete with braided stainless outer housing and heat resistant E-Z to read flexible inner dipstick measuring cable. Inner cable is molded with appropriate trans fluid levels. Billet aluminum handle and billet aluminum fittings complement Lokar's Flexible Engine Dipsticks. Kit includes dipstick funnel adapter to assist in filling. Dipstick seals with double O-rings. Kit comes complete with installation instructions.